Tarmac runoff is the preferred option for most tracks these days, with gravel coming in a close second when it comes to trying to slow out-of-control cars down safely. At the very least you’d expect some barriers. 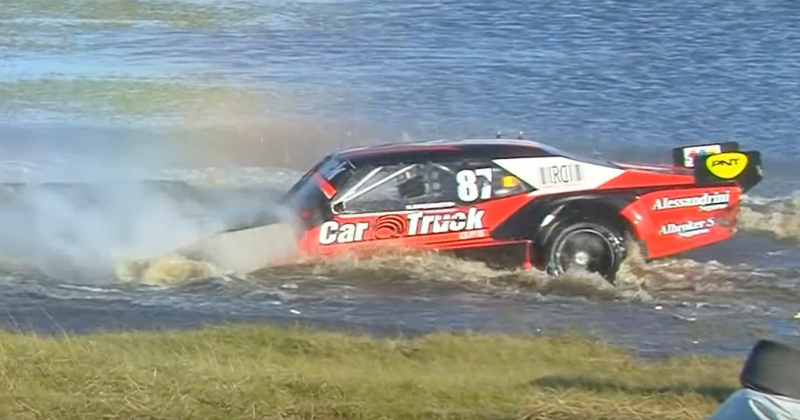 The Autódromo Roberto José Mouras in Argentina has another solution, however: water. During a round of the TC Mouras series at the circuit, drivers Maximiliano Vivot (No.2) and Nicolas Impiombato (No.87) got together and spun off the track. Vivot came to a halt on the grass, but Impiombato kept going until he found himself in a (thankfully shallow) lake. National level motorsport: don’t you just love it?